Bayas del Sur S.A is a 26 years old agricultural industry, located at X° Region of Chile named as “Región de los Lagos”, wich is in transit the door of the patagonic area. The facilites are in the middle of the berrie´s production area with species such as blueberries, blackberries, raspberries, strawberries, elderberries, cranberries, rosehip, calafate, maqui berries, boysenberries and others, like cherries, pomegranate, prune, kiwi, and others. At the present, the fruit Company ´s activity is the elaboration of juice concentrate and powders coming from the berries or so called “Superfruits” always looking for the benefits from these one such as puree, lyophilized and spray dried products. Our product is focused on natural juices, dairy products, ice-creams, ingredients, bakery and cosmetic. The company is available to produce different and demanding specifications and qualities, containing high levels of Oxygen Radicals Absorbance Capacity depending on the type of fruit, according to the personal requirements of each client, dealing with high quality standars. The sales are focused on the international markets where it has achieved a penetration in over 32 countries meaning more than 120 foreign customers, in different markets, becoming a local leader and recognized abroad. Moreover, the Company has a comercial officce, wich is located in San Fernando, city, VI region Del Libertador Bernardo O”Higgins, on Valdivia street, Nº528. 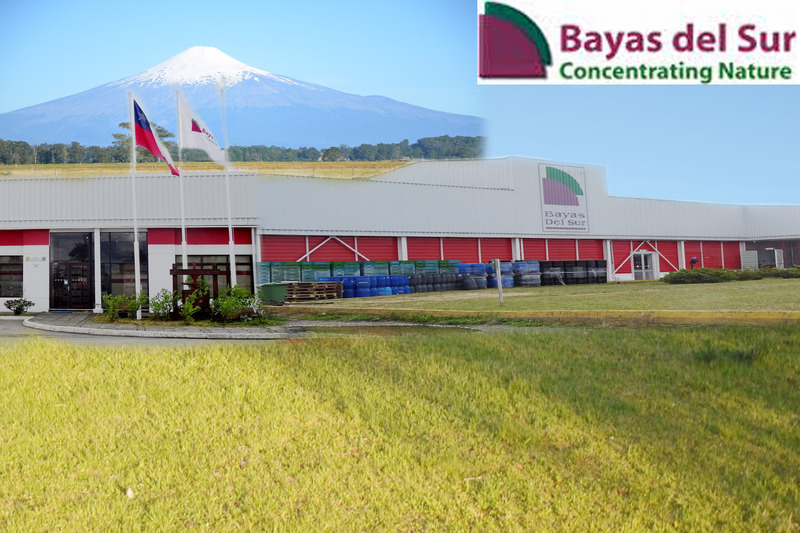 Bayas del Sur is certified by high standars of quality such as: Japan Agricultural Standars (JAS), British Retail Consortium (BRC), HACCP, APL, Halal, Organics (from BCS) and others. It is very usual that some clients certify the installations, the production processes, the quality control methods and traceability.